Ese - last of his tribe was designed by John Leaños in collaboration with Monica Praba Pilar, Rene Garcia, Gerardo Perez, and Jaime Cortez. The mural occupies the Bryant Street wall of Galería de la Raza, at 24th Street. The year is 2002, and all the Mexicans have been cleared out of the Digital Zone (formerly known as the San Francisco Bay Area). A living Mexican was discovered in the wilds of Dolores Park, living off berries, roots, and crumbs of focaccia. His name is Ese, and he ended up living in Dolores Park when the studio apartment he shared with three others was reclassified from an apartment to an epartment with a corresponding rent increase. The hustings are bare this Labor Day weekend. Tom Ammiano has flown south to meet with human rights activists in Chiapas. At home in the Mission, signs of the upcoming campaign are scarce. A few placards attached to utilities poles juxtapose the names of Lucrecia (Bermudez) and (Ralph) Nader. At Folsom and 26th, pastel flyers festoon the headquarters of Valerie Tulier. But from the activity on 24th Street, or Valencia, or Cortland Avenue, a visitor would find it hard to believe that he was standing at the very center of the whirlwind that will become this November’s election. Or perhaps he would understand, for the eye of the storm is proverbially quiet and so is District 9. For now. In any case, the race for supervisor is considered a done deal, with Ammiano expected to coast toward victory on the coattails he himself spread out in the mayoral election last fall. Unlike District 2, where no candidate was willing to oppose incumbent Gavin Newsom, the feisty district to the south has produced four people — Bermudez, Tulier, Maria Martinez, and Ron Norlin — to keep the Board of Supervisors president from getting too comfortable. Progressive Left candidate Bermudez, in particular, is outspoken in her criticism of what she regards as his selling out in order to become "electable" as mayor. Oddly, given Bermudez’s history of fiery confrontations with Ammiano, it is not the supervisor’s race that clamors for attention in this district. Rather, center stage has been seized by Proposition L, initiated by the Campaign to Save San Francisco in an attempt to limit office development in the Mission, Potrero Hill, and Hunters Point. In the very center of the stage stands the Mission: not only did local activists set up the springboard that launched this controversial ballot measure; the very future of the area depends on its passage. But I’m telling the story backward. Let’s take a look first at District 9 in its entirety. The estimable David Binder tells us that it contains four major neighborhoods: East Mission, Valencia Corridor, North Bernal Heights, and South Bernal Heights. What he doesn’t tell us is that this is a pretty pleasant spot to live in. It’s easy to imagine Father Junipero Serra and his party of soldier-settlers smiling with self-satisfaction as they compared their sunny mission, irrigated by a stream and a nearby lake, with the foggy wind-blown point on which their military brethren had planted their presidio. Of course, pleasant is in the eye of the beholder, and the hundreds of Indians who succumbed to measles, smallpox, and venereal disease may have had other thoughts. But the fault lay with the proselytizers and not with the place itself. 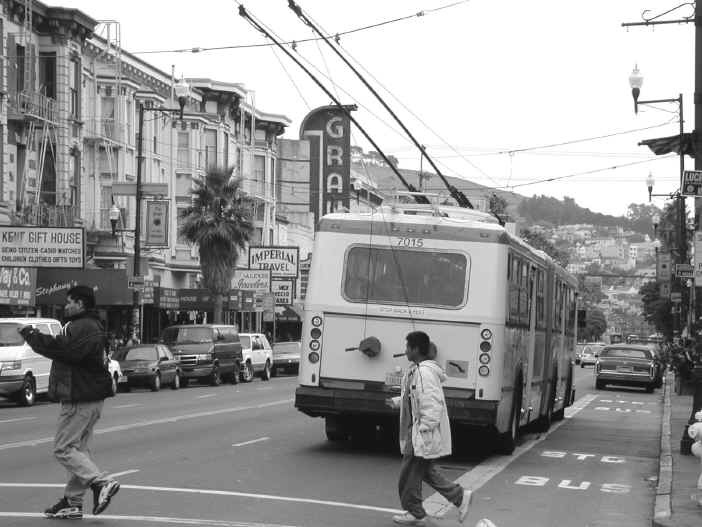 The early Spaniards laid the warp of future district’s fabric: the Mission became the point of entry for successive waves of immigrants, making it the exemplar of San Francisco’s diversity. In 1906 thousands of Irish families left homeless by the earthquake moved here from the south of Market. In the 1960s a guidebook reported that, in addition to the substantial Latino population that had replaced the Irish, there were Maltese, Norwegians, Greeks, Portuguese, Russians, Italians, and Germans. Today Latinos make up 48 percent of the district (compared to 13 percent citywide), with Anglos coming in second at 30 percent (compared to 47 percent citywide). At the same time the Indians, whom the Spanish padres set to weaving, farming, and generally doing the day-to-day work of the mission, laid out the weft: the area has traditionally been home to working-class people. Today the residents’ median household income is $30,066, more than 10 percent lower than the citywide equivalent. Each neighborhood of District 9 proudly displays its own individual characteristics. In Bernal Heights, where dogs seem to outnumber people, people tend to own their homes — 71 percent in South Bernal, compared to the district low of 20 percent in the Valencia Corridor and 45 percent citywide. 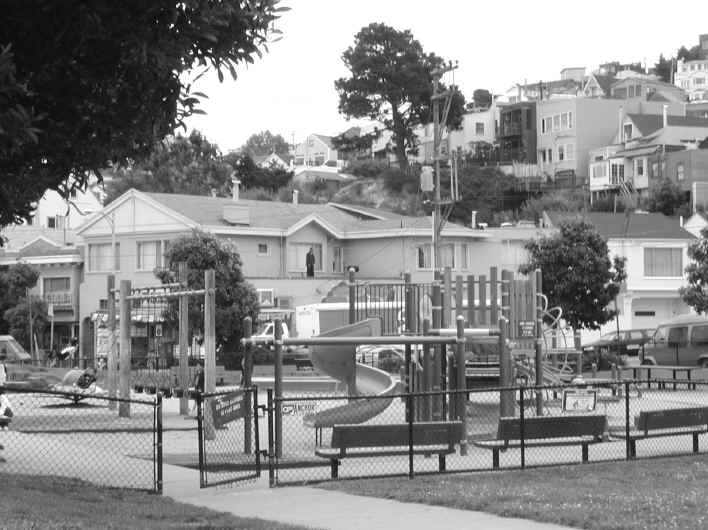 North Bernal is older, whiter, and more likely to be gay or lesbian. Valencia is younger, with the largest contingent of queer voters. The East Mission is most thoroughly Latino. Nevertheless, the district as a whole has a personality distinct from the city at large. It’s literally colorful, from the purple hair of the trendy people in black who frequent Valencia Street to the bright murals that adorn the walls of countless buildings in the Mission. It’s young. Astonishing in a city where children are rarely visible, kids seem to be everywhere — in uniforms, pouring out of Catholic schools; on scooters, careening down the sidewalk; in strollers, dozing while their mothers shop. It pulses with human energy. Home to countless artists and activists drawn to the area’s low rents and hospitable atmosphere — think North Beach in the 1940s and 1950s — it regularly produces new and wonderful art forms and political protests. Music pours from open windows by day, from clubs catering to many ethnicities by night. The entire area seems to run on an electric current produced by thousands of people skillfully navigating a bi- or policultural world, a way of life that most monoculturalists cannot even imagine. And it’s under siege. The city solons have been nurturing an economic boom that leaves little room for a diverse, working-class area like this. To meet a perceived need for work space, out-of-proportion office complexes are displacing smaller, older structures, depriving the neighborhoods of human-scale architecture and reasonable rents. To meet a perceived desire for living space, landlords are selling duplexes and apartment houses out from under their low-income tenants. There’s nothing subtle about the process. It’s omnipresent. On a chilly evening last spring, two families sat together in a Thai restaurant on 24th Street, the children doing their homework while the adults joked in a mixture of Spanish and English. From the next table, grating against the laughter, came the voice of a leather-jacketed developer, complaining about the expense of evicting tenants from a recently purchased property. The Mission and Valencia form the battlefield. Pace Examiner reporter Vanessa Hua, the beleaguered residents are very aware of the invaders’ presence. They hear complaints about noise emanating from their long-established restaurants and clubs; they watch cars circling the block, seeking parking near newly established places of entertainment. Even the folks on the hill note the newcomers’ presence, as SUVs clog the narrow Bernal lanes. But most of all, the residents know they’re in the way, impediments to someone else’s plan. They are not caught in the kind of natural residential turnover that invigorates city life. Triggered tempers on both sides may exacerbate the tension, but it’s not a simple misunderstanding. Recent history has shown — in spiraling house sales and supporting Planning Commission decisions — that the barbarians are at the gate, willing to pay any price to get them out. At the same time that residents fight to stay where they are, they also confront the usual problems associated with low-income urban neighborhoods — especially increased crime and reduced social services. They could use an economic boomlet of their own. And given half a chance, they’ll make one. They have an excellent model in their own backyard. About a decade ago, Bernal Heights reeled from similar problems, as iron bars fronting many porches attest. The citizens got together, figured out what they needed, and insisted they should get it. Today they — and especially Mauricio Vela and the Bernal Heights Neighborhood Center — have a reputation for constructive engagement in local affairs. Bernal Heights has its own building code, which Noe Valley would do well to consider. The Neighborhood Center has sponsored several affordable housing projects and redefined the contours of others. Opinions vary, depending which side of the fence the observer occupies, but few refuse to take the neighborhood seriously. During the past few months, the attention of activists has focused on the Mission-Valencia area, where needs are greatest. 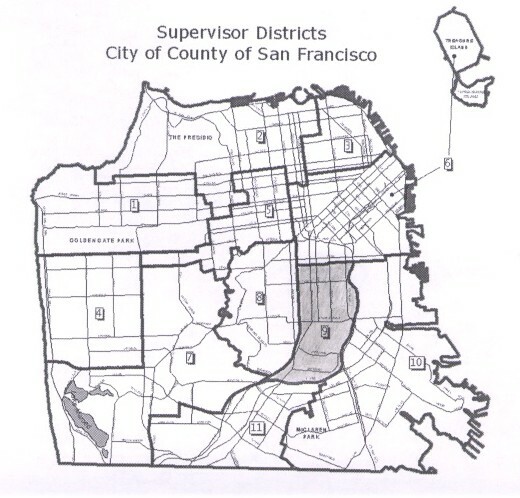 (The Mission continues well past 17th Street, where District 9 stops, setting up a natural alliance with District 6, which includes the Inner Mission and the Tenderloin.) 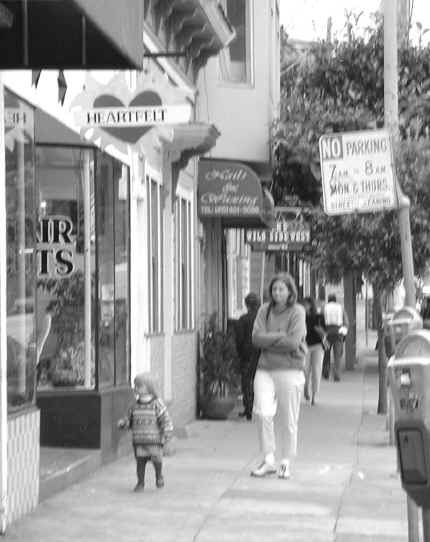 After a few skirmishes over individual properties, a coalition looked back to the last time San Francisco citizens successfully put a lid on out-of-control development and came up with Prop L, daughter of Proposition M of the 1980s. Our Mayor was understandably loath to relinquish control of the development program that has marks his administration. He countered with his own watered-down initiative. Even though, ever the realist, he has conceded the district’s supervisor seat to Ammiano, the introduction of Prop K makes it clear that he regards District 9 as the decisive arena in this fall’s election. His future action, his reputation, will stand or fall, depending on how this district votes. Traditionally, this district doesn’t vote. The turnout tends to be lower than the city at large by as much as 9 percent. But when issues affecting the residents are at stake, such as last November’s mayoral election, the citizens mobilize. And you can be sure that no prospective voter will remain ignorant of the issues at stake in this election. If you look around, you quickly realize that the area occupied by the Mission nestles in a box, its walls formed by Potrero Hill, Bernal Heights, Twin Peaks, and the downtown skyline. Warm air settles on this valley floor. So do a variety of ills. But like another box, opened centuries ago, this one contains its own antidote. The signs at Valerie Tulier’s headquarters say it: "Raising hope."